We all need something to turn to that helps us through those tough times, that thing we can turn to for comfort. For me that thing is writing, it has been something I have turned to in good times and in bad times from the time I was a kid. When things in school were really bad with bullying and life was tough I would write down my feelings and get it out. As I got older I kept doing it and it was always a safe place for me to say what I really wanted to say. I also wrote a lot of poems and short stories that really showed how I was feeling at that time. The thing that I really love about writing is that it is something that I have always been able to do no matter where my vision was at. I never needed to do anything different than anyone else I could always just put down my thoughts and have that outlet that I needed for me. Finding what works for you is an important part of our lives it is what we can turn to when we need that outlet. I have always been a little shy about sharing my creative writing but I think it is a good thing to share a part of yourself sometimes to let people know who you are. I wrote the following piece for a creative writing class that I was taking a few weeks ago and thought I would share it here today. As I sit and enjoy the world around me I am reminded I experience the world around me in a unique and beautiful way. It reminds me how lucky I am to live the life I do. As I sit here I hear the birds chirping and the wind rustling through the trees leaves. I hear the buzzing of the bees and wasps nearby. The water rushing into the shore and lapping against the rocks. As I sit here I smell the fresh cut grass, the fresh air and flowers blooming nearby. The smell of fresh water and fresh grass alongside the flowers is a tranquil smell, it reminds me how lucky I really am to be able to sit here and enjoy the world around me. As I hear a bike pass by on the path the rocks popping under the tires, a stroller goes by and I hear the giggles of a young child. The freedom we all feel when we are young is something I never want to lose. As I sit here and my skin warms from the sun shine, and I feel the cool breeze every so often, my skin prickles with the sensation of a beautiful spring day. As I sit here in the dark I am able to enjoy the beautiful sunshine, and everything the seasons bring with them. Not missing a beat but enjoying every second of the world around me. There are many people out there that once they find out I am blind assume that I am miserable and live a horrible life. 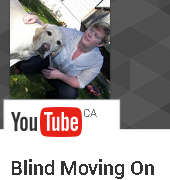 I have really made it my mission to show people the positive side of blindness and that I don’t live a miserable life. I wake up every day and live my life the way I want, I do not sit in a rocking chair listening to the radio. There is a side to my life that I am not always as willing to speak about and that is that I suffer from depression, my blindness and my depression however are not related. I am not depressed because I am blind, I am not depressed because I feel like I am missing out on life and my family. My depression is something that I have struggled with my whole life. Many times when I get depressed it is because I don’t feel like I am pushing myself hard enough or that I am not on the path in life that I feel like I should be on. I can be my worst critic and I am very hard on myself to succeed. There are many people out there that suffer from depression even if they do not live with a disability. I believe that it is an important thing to talk about and to not hide because when we speak about it we break down the stigma behind mental illness. There is no shame in taking medication to help you deal with mental illness, it also does not make you less of a person. We all have struggles that we need to work through and overcome, the way that we deal with those struggles will determine how you come out on the other end. So many times with social media we look at Facebook or Twitter or even Instagram and think wow I wish my life was as good as theirs or I wish I had their life. The thing to remember is that we all can portray whatever we want on social media. Most people will not post the truth and the ugly that is in their life. I think it is very important to show people the good the bad and the ugly because that is reality. That reality will make us stronger it will make us better people. There is a silver lining to the days that I am just really struggling to see the positive things around me, and that is that Rick (my Guide Dog) seems to know when I am feeling down and he gives extra cuddles and extra love and can usually help me see the positive things all around me. There are many different parts of my life that make me the person I am and I am proud of all of them. I hope that if any of you are struggling in any way you are able to look at the positive things around you and take the time to be the best you.